A start-up led by a video game developer has created an app that allows medical students and doctors to practice minimally invasive surgeries using smartphones or tablets. Level EX developed the application, which is based on actual patient cases, to help surgeons develop the hand-eye coordination necessary to navigate a 3D setting prior to a patient procedure; the app has also been qualified as a surgical training tool for physicians to gain Continuing Medical Education credits from the American Medical Association. About 60% of physicians already use virtual reality technology to gain expertise for surgical techniques that use endoscopic tools. But surgical simulators today tend to be large devices that run in multi-million-dollar simulation centers. Sam Glassenberg, founder and CEO of Level EX, compared the surgical simulation marketplace to the video game industry of the 1980s -- when people had to go to an arcade because the gaming equipment was expensive to purchase and maintain. A patient's Larynx as seen in the Level Ex simulator. "For example, if [a physician] wanted to do a day of training, it costs a lot of money, you need to lose a day or two with patients. It's very inconvenient and also the quality isn't very good," Glassenberg said. "That's the model we had in the video game industry 30 years ago. In the 1980s, if you wanted to play video games, you drove across town to the arcade. "Nowadays, no one goes to the arcade. Everybody just plays games on the device in their pocket where you can get experiences that are high quality, free, easily accessible and update regularly with new content," he added. Research firm IDC expects Augmented Reality/Virtual Reality (AR/VR) spending in healthcare to reach close to $1 billion in sales in 2020, but most of the money for surgical simulations will be aimed at high-end technology. Though surrounded by people in the medical profession, Glassenberg said he never expected to create applications for the healthcare industry. He refers to himself as the black sheep of his family. After all, his father is an anesthesiologist, his mother works for the Journal of the American Medical Association and his wife is a pediatrician. Glassenberg, on the other hand, is a gaming programmer. Prior to launching Level Ex, Glassenberg was the CEO of Funtactix, an online game development studio that was acquired by Playtech in March. He once worked as a developer for LucasArts, developing the Star Wars games, and said he was a lead developer for the DirectX at Microsoft, which created the APIs for video game consoles and gaming apps. Pediatric Virtual Intubation with Airway EX app from Level EX Team on Vimeo. The inspiration for his career in medical simulators came in 2012 when his father, who works at Chicago's Northwestern Memorial Hospital, asked him to build a fiber-optic laryngoscopy simulator. A laryngoscope is type of endoscope for examining the interior of a patient's larynx. Glassenberg's father wanted the app so that his residents could train for the procedure on their iPads. Glassenberg developed a prototype which was called iLarynx. "I sat down with a game engine for a few weekends, threw together a crude simulator, and I put it into the app store because I didn't want to install it on the iPads manually," Glassenberg said. "I didn't think about it again." Several months later, Glassenberg checked on the iLarynx app and found it had been downloaded more than 100,000 times. The medical community had performed efficacy studies on the app showing it had improved medical residents' performance, and it was being preinstalled on Stanford University's medical school iPads as well as the electronic devices from several medical schools in China. "When I saw that, I realized there's clearly a big gap here and there's a substantial business opportunity as well as an opportunity to have an impact on surgical outcomes," he said. Last month, Level Ex released Airway EX -- a simulation app targeted for use by anesthesiologists, otolaryngologists, critical care specialists, emergency medicine physicians and pulmonologists. Airway EX includes various endoscopic procedures, is now in beta testing and is available for free in the iTunes App Store and on Android. 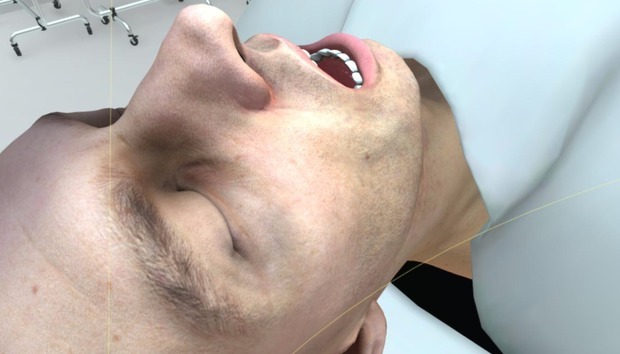 Physicians who work with Level Ex send the company videos and CT scans of patients and their actual procedures, and the company turns those into the VR models. Level Ex has so far raised more than $2.1 million in venture funding led by Jazz Venture Partners and now has 20 employees. The Airway Ex app has been refined not only by Level Ex's staff of programmers but also with input from surgeons around the country who were consulted for their knowledge of various minimally invasive procedures. "If you fail in the procedure and hit a patient's vocal cords, it will trigger a cough," Glassenberg said. "Everything is squooshy. We're really simulating the behavior of the anatomy." Even rare throat surgeries, such as the removal of a tumor that is partially blocking a child's airway, is simulated to include bubbles coming from air pushing past the growth. Level EX :60 Trailer from Level EX Team on Vimeo. "These are all based on actual cases. The team looks at videos of actual cases and builds out as case presentations," said Dr. Eric Gantwerker, a Level Ex advisor. Gantwerker is an assistant professor and pediatric surgeon at the University of Texas Southwestern's Children's Health facility. About a year ago, when Gantwerker was approached by Level Ex, he said he immediately saw the added value over the medical industry's traditional educational model of seeing an operation, then performing an operation and then teaching that operation to another surgeon. "That's the way physicians have been taught for generations. If something goes wrong, those patients die. People in medicine see the value add to practice these events in these virtual environments," Gantwerker said. Each year, from 44,000 to 98,000 deaths occur worldwide due to medical errors during patient treatment, according to the Institute of Medicine, a non-profit organization founded by the U.S. National Academy of Sciences. Medical procedure simulations, including virtual reality applications, are used extensively to reduce those errors. It is a rapidly growing market. The app is just as useful to teach common procedures, such as inserting a breathing tube in a patient or removing common papillomas, a benign epithelial tumor, Gantwerker said. According to Chris Chute, vice president of IDC's SMB Cloud & Mobility Practice, start-ups will drive a lot of the forecasted spending in the VR medical market. "And it doesn't have to be high-end surgical use cases; frankly, a lot of regular patient and colleague interaction will be fueled by AR/VR via consumerized apps that can run on iOS/Android," Chute said. Not everyone is convinced of Level Ex's VR classification. J. P. Gownder, vice president and principal analyst for devices and platforms, at Forrester Research, said mobile device apps aren't true virtual reality unless they're viewed using a 3D emulating headset such as those used for Google Daydream or Samsung Gear VR. "I'm not familiar with [this] startup, but the vanguard of VR in this space is detailed replication of complex environments like ORs for surgical training or visualizing organs and such. I wouldn't consider a flat-screen mobile app VR; that's just hype," Gownder said. Gantwerker said the Airway EX application is as real as any VR simulator he's seen. For example, in the app a virtual patient's larynx is coated with flowing saliva. If a surgeon while using the app's various orthoscopic scopes with cutting implements strikes a virtual patient's tissue, it will bleed. The scopes also cause patient reactions when they tissue is touched. "These are hard cases, so they're just like the type of case a doctor would present at conference or at an annual meeting," Gantwerker said. "From a physician side, I've played with all the apps from Level Ex and showed them to many colleagues, ER and anesthesiology folks. ...It's ultra-high realistic." The Airway EX application is expected to be followed by additional mobile apps that will offer a VR experience in several other specialty areas, including cardiology, gastroenterology and orthopedic surgery, Glassenberg said. "We're closing a gap, a several decades gap in the business model and a decade gap in technology," Glassenberg said. "And, we're a bunch of game developers pushing pixels and saving lives." What should you know to handle a cybersecurity crisis? Q&A: What do you need to know to run an ICO? What can we learn from new Venezuelan cryptocurrency? Will cryptocurrencies ever overtake conventional currencies?